New observations of the Air Force'ssecretive unmanned X-37Bspace plane have put the spacecraft's classified mission back in thelimelight.While many ponder the exact nature of such a vehicle, some experts havealreadygone on record questioning whether a robotic space plane is even needed. Cheaper alternatives exist for justabout every missioncapability that the X-37Brobotic space plane might possess, according to an analysisby the Union ofConcerned Scientists (UCS) released during the spacecraft's currentmission.The organization's experts want the Obama administration and Congressto reviewthe U.S. commitment to a space plane program. Perhaps the main unique advantage ofthe X-37B is theability to return experiments or hardware to Earth for inspection, asAir Forceofficials pointed out before the space plane's launch in April. OnlyNASA'sspace shuttle currently has that capability, but the shuttle is slatedto fly itsfinal missions during the next year or so. Much of the uncertainty also restswith the program'sunknown price tag. The spaceplane's long history includes not just Boeing Phantom Worksas primarycontractor for the U.S. Air Force, but also NASA and the Pentagon'sDefense AdvancedResearch Projects Agency (DARPA). The main issue with the X-37B is alack of a compellingmission, according to Grego and UCS colleague David Wright, whodescribed theirconcerns in June on their UCS blog "All Things Nuclear." They alsorecently co-wrote "Securing the Skies" ? a report that outlines 10steps the U.S. should take to safeguard space. Other systems that don't return toEarth can carry payloadsinto orbit, maneuver in space, meet up with satellites, and releasemultiplesatellites or other payloads at much lower cost, Grego and Wright said. The ability to bring a payload backto Earth represents afairly unique capabilityfor the X-37B. Yet the UCS researchers said satellite repairor recoverydon't make much sense because of the X-37B's small payload bay, whichis justthe size of a pickup truck bed. By comparison, the space shuttle'spayload bay could fit twoentire X-37Bs inside. As for deploying space marines, theexperts say forget aboutit. An X-37B's gliding approach for landing would make it easy prey forairdefense systems, and hardly justify the high cost of dropping off a few fighters. "It's hard to think of what couldmake that missioncompelling," Grego told SPACE.com. "It doesn't protect you fromantiaircraftfire, and the element of surprise doesn't really work in your favor ifyou'relaunching on Atlas V [rocket]." Similarly, the X-37B represents avery unlikely carrier of missilesor other weapons because of its payload restrictions, costsand vulnerabilityas a slow, gliding bomber, according to the UCS researchers. Their assessment largely agrees withan earlier analysis byBrian Weeden, a former U.S. Air Force orbital analyst and now technicaladviserfor the Secure World Foundation. Weeden had rated the likelihood of aweaponized X-37B as "zero." "I would say that right now the spaceplane is probablymore responsive in terms of meeting a war fighter [operationallyresponsivespace] need than anything else we have," Weeden said. "But thatdepends a lot on the turnaround time." An X-37B could reconfigure its sensorpayload for each mission.That payload would depend upon the needs of a military commander orintelligence agency to peek at certain parts of the world, Weedensuggested. Having more propellant to burn permission than a permanentsatellite could also enable the X-37B to change its orbit, andtherefore havethe flexibility to change its coverage area on the fly. Finally, the space plane has apossible time advantage overa satellite launch mission in terms of preparations, Weeden said. Eachsatellite design has a unique way of "mating" with the booster rocketthat carries it into orbit, which can become a time issue on shortnotice. Air Force officials might bypass thatissue during anemergency by simply sticking whatever sensor payload into the standardbodyof the X-37B. Without knowing the exact costsinvolved (they'reclassified), much of the debate about the X-37B might also come down toviewpoints. Where the UCS researchers and even Weeden see a lack of anysinglecompelling mission, the Air Force and the U.S. Department of Defensemay savorthe realm of possibilities. Weeden noted the Department ofDefense has often favoredsuch jack-of-all-trades systems during recent years. "The X-37B doesn't do one thingreally well, but itdoes a lot of things," Weeden explained. "So in that sense, I can seethe argument for it." Much of the speculation about theX-37B's reusability ultimatelydepends upon how well it performs during re-entry and landing. Such anautomated plane-like landing would represent a first for the U.S. AirForce. Only the Soviet Union has previouslydemonstrated such anautomated gliding return capability with its Buran version of the U.S.spaceshuttle. "From everything I know about it,it's not that muchmore advanced than the shuttle," Weeden said. "It's evolutionary, notrevolutionary, with respect to the shuttle." Such a landing certainly hasadvantages for delicate orsecretive military and intelligence payloads compared to a capsuleparachutelanding. "It's nicer to have it land on yourrunway than havingto scoop it up in the ocean or from a landing in the desert," Gregoadmitted. Yet she and Wright at the Union of Concerned Scientistsremainunconvinced that the costs justify the space vehicle. Whatever the X-37B's capabilitiesnow, it started out as afairly ambitious NASA project under the X-37 designation. NASA andBoeingsigned a $173 million cooperative agreement to jointly develop thevehicle backin 1999. The Air Force took early interest inthe X-37 as a possiblespace maneuvering vehicle, according to Susan Turner, former deputymanager forNASA's X-37 program. But the U.S. space agency had more interest inadvancingthe overall technologies of reusablespace vehicles. The space agency aimed to include awhole new batch oftechnologies, Turner said. Those included the automated re-entry andlandingsystem. NASA also wanted flight controlsdriven entirely byelectromechanical actuators (EMA), which eliminate the bulky hydrauliccircuitsin normal control systems and take the approach known as power-by-wire.The X-37'sbraking system would have also incorporated EMA. New thermal tiles were required toprotect the X-37 againstthe fiery heat of re-entry, because of its steeper inclination approachcompared with the space shuttle. The heat load also rises because ofthe X-37'ssmaller size, which means less surface area to bleed off heat. So-called hot structures were plannedfor the ruddervators,which combine the elevators and rudder control surfaces that help steeranaerospace vehicle. The hot structures aimed to shrug off the re-entryheat loadwithout requiring additional tiles or blankets for protection. "We were going to fill the sky withX-planes,"Turner recalled. She is currently with the engineering directorate atNASA'sMarshall Spaceflight Center in Huntsville, Ala. But the X-37 only managed to surviveas a NASA project until2004, when President George Bush announced his moon-centered NASAinitiativethat left no room for a reusable mini-shuttle vehicle. Eventually, NASA transferred the X-37project to thePentagon's DARPA, which in turn handed off the project to the Air Force. 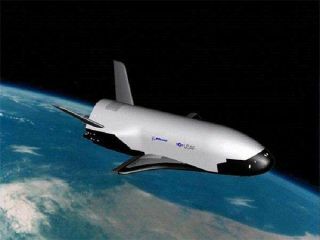 Size restrictions prevent the X-37Bfrom becoming afull-fledged shuttle replacement, at least as far as flying humans isconcerned.In fact, NASA had once considered flying the predecessor X-37 as asecondarypayload within the shuttle, Turner said. "[X-37] was always simply atechnology demonstratorthat didn't put people at risk, and cost less in theory than theshuttle,"Turner said. She added that NASA also hoped at one point to use theX-37 as along-duration orbital vehicle, which is not unlike how the Air Forcemayconsider the X-37B. The X-37 could have also launchedmore often than theshuttle aboard an expendable Atlas or Delta 4 medium-class rocket. Suchmissions could have taken science payloads into orbit more frequentlyratherthan get in the long line for a shuttle launch, and still takeadvantage of X-37'sreturn capability. Similarly, NASA had interest in theX-37 as a reusableplatform to fly hardware in space for testing purposes, so thatengineers couldknow how well such systems fared. Those testing opportunities comerarely,Turner said. Cost and effort aside, Turner seemedglad the X-37 finallyreached orbit as the X-37B, even as outside experts continue to debateitspurpose and cost-effectiveness as an Air Force vehicle. "I always tell people it's hard tokill a good idea,"Turner said.